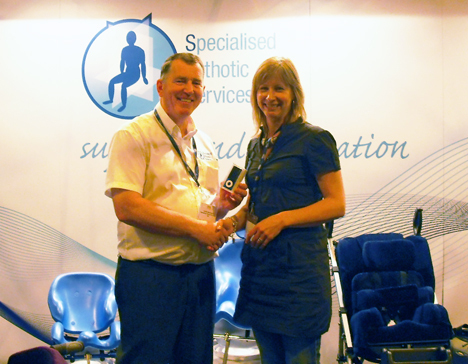 Leading seating experts Specialised Orthotic Services, known as SOS, created a buzz with the launch of its next generation straddle seat “the Equipoise” at Glasgow’s Mobility 2010. Brand new to the market, the Equipoise is the latest innovative seating solution for disabled children who need support to develop effective seating balance. Taking principles from the sitting position found in horse riding it places the child in an enhanced and supported posture by stabilising the pelvis helping to work on a poor centre of gravity often found in conventional seating positions. As the child’s spine is positioned correctly and their limbs bent it also helps improve balance and movement. Its components are adjustable so it can grow with the child making it an excellent aid for helping postural development from a young age. The seat also allows the child to take part in activities which normally require standing and so it is particularly useful in a school environment as it can be used at work tables and desks as the height can be changed as required from low to high. Alternatively an additional tray, which is secured to the front of the Equipoise, is available. Gordon McQuilton, managing director of SOS, explains: “The Equipoise is an excellent addition to a child’s seating options. It opens up the child’s chest and abdomen improving function and reducing complications and because of the position the child is in it helps improve muscle tone as the muscles are in an ‘active’ position. SOS has a nationwide clinical team and offers a guaranteed fast turnaround – from client consultation to delivery – and after sales support from its Tutbury, Staffordshire base. Photo caption: Gordon McQuilton, Managing Director of SOS and Liz Anderson, i pod winner. Gordon McQuilton, Managing Director of SOS and Liz Anderson, i pod competition winner.